Making vegetable stock from my kitchen scraps isn’t something that I’d ever thought about doing until just recently. 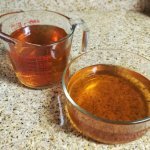 A few weeks ago I checked the Cowgirl Chef cookbook out of the library, and there was a recipe for making your own vegetable stock from kitchen scraps. I go through a lot of onions, carrots and celery every month, and all this time I’ve been throwing out my scraps because I thought they were useless. Boy, was I wrong! Throughout the week (or month), you just collect your onion, carrot and celery scraps in a quart size bag, Then, when it’s full, make a batch of stock. Easy Peasy! By the way, if you haven’t seen this cookbook, definitely check it out. The author is Ellise Pierce, who is a fellow Texan and blogger. She grew up about thirty minutes from where I currently live, but moved to Paris to be close to her French boyfriend, whom she’d met here in the states. The cookbook is full of short stories about her in life in Texas and France. The book itself is what I consider to be the perfect size for holding. Seriously, more cookbooks should come in this size. Anyway, on to making veggie stock. I’m not lying when I say this will make your home smell AMAZING. It’s crazy how good just plain kitchen scraps can smell when they are simmering away on the stove. I have some on my stove as I’m typing this, and my whole apartment smells delicious! 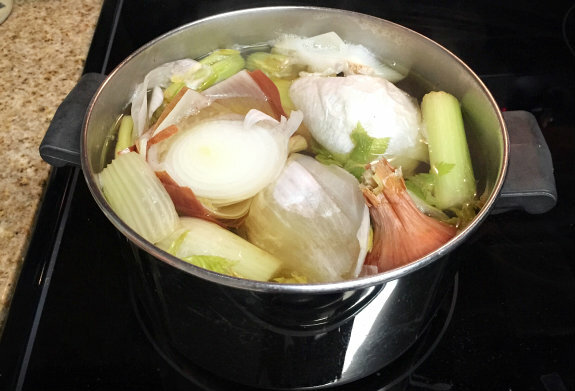 To make this Vegetable Stock recipe, you will need a 4 or 5 qt. pot to make your stock. I use my 4 quart pot and fill it about an inch from the top with water. I throw in my vegetable scraps, a couple of bay leaves, some black peppercorns and a tiny bit of salt. Then, I bring it to a boil, turn it down to simmer, cover and let it cook for about four hours. Then voilà, you have veggie stock. Look at that gorgeous colored liquid! If you happen to also have a carrot or celery stalk in the crisper that’s starting to look a little limp, then you can throw that in the pot, too. For this particular batch, I did that exact thing. If you have some fresh thyme, basil or parsley hanging around, you can toss that in as well. 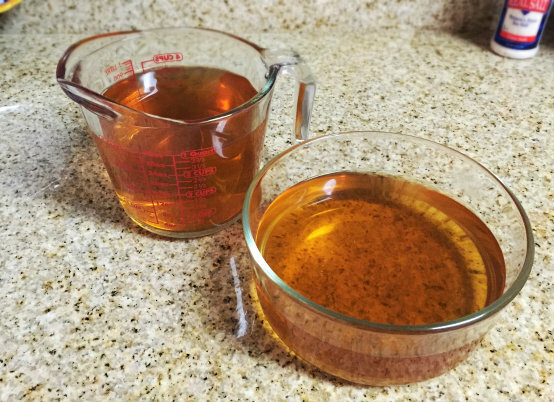 This yields about 2 quarts of vegetable stock, if you are using a 4 quart pot like I do.To strain the stock, you can use some cheesecloth placed over a colander or strainer on top of a large measuring cup or bowl. I have been pouring the stock into quart size freezer bags, with 2 cups of liquid per bag. I let them freeze laying flat, so that they don’t take up a lot of room in the freezer. 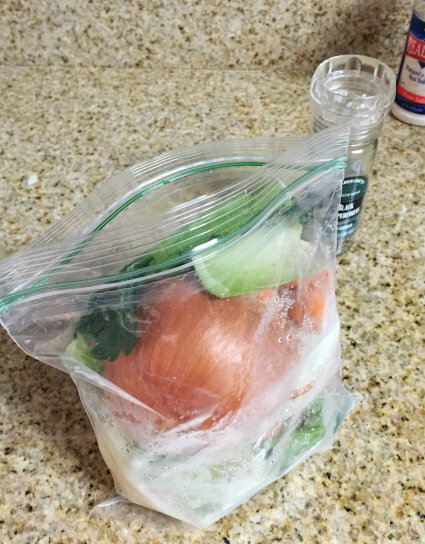 You could freeze it in 4 cup portions using a larger bag if you prefer. Place all ingredients into a 4 or 5 quart stockpot and bring to a boil. Reduce heat to a simmer, cover, and let cook for about 4 hours. Check seasoning and add salt if needed. You can also just omit it completely. Strain the stock through a piece of cheesecloth placed over a colander or large strainer on top of a large bowl. Let the stock cool completely, then either refrigerate or freeze until ready to use. I haven’t been organized enough to save my scraps, I know some people save them in the freezer, but I do love a good homemade vegetable stock, so much better than from the store! I have some in my freezer right now.